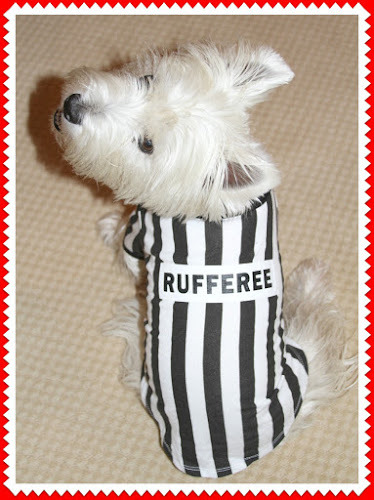 The White Dog Blog: Happy Halloween!!!! We like that! Hope you have fun tonight with the tricksters. We're battening down the hatches and pretending not to be home! We know .... boring, but that's how They like it. So Happy Howl-o-ween Duncan. RooOOoodles! Few will match you for style tonight Duncan. Very cute Duncan!! Better than those replacement Zebras they had at the beginning of the NFL season!! Great costume and functional as well! Awwww! You look so cute. Our Halloween is over. We were banished to the back yard so we didn't scare the kids....we thought that was the point. Anyway, there were a few dropped 'treats' on the street this morning, so we cleaned those up. Now we're ready for our first November nap. What a great costume! We hope you had a wonderful Halloween, Duncan! Hi! Its Chloë! I'm am Matt Boyd's daughter. I LOVE your dog blog!!!! So cute!! Can't wait to read more!